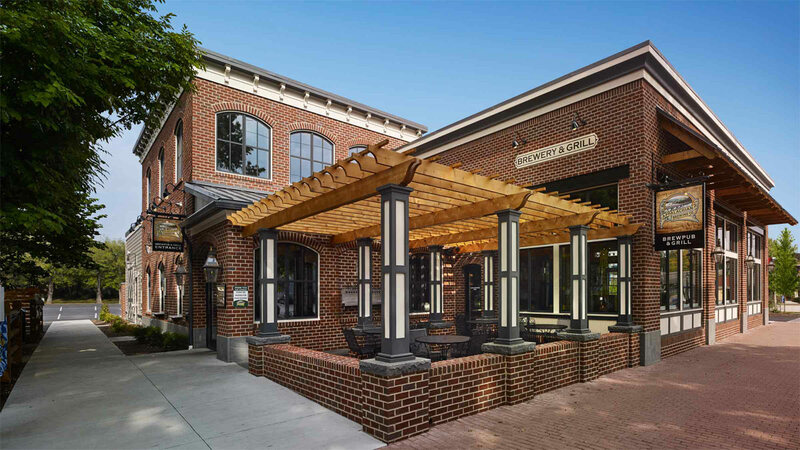 Adjacent to one of the most significant historic battlefields in our nation’s history, Appalachian Brewing Company-Gettysburg Battlefield opened in the summer of 2016 on Steinwehr Avenue amidst historical landmarks and bustling tourist attractions. The company’s original brewery and brewpub were located in Harrisburg, PA, and founded in 1997. Today, each of Appalachian Brewing Company’s six locations has its own soda-batch craft beer brewery and serves its own Appalachian Craft Soda. TONO Architects worked together with local construction company Mark Austin Building & Remodeling to complete this project. The property developer, Tim Shields, saw the potential to have ABC anchor and attract many. Located on an historic street in downtown Gettysburg, the site posed many opportunities for creativity and innovation in order to meet town and borough regulations. Having combined the small-town feel with a fresh new look, we accentuated the restaurant with a great bar, plenty of seating (inside and outside on the patio), and a walk-up beer and soda window–perfect for sips and samples in the beer garden. Windows were added to include natural light and ceilings were raised for a monumental feeling of freedom. Finally, an art installation of taps was included to complement the maker’s craft. We were honored to contribute to the rich heritage of such an important place in our country’s history.